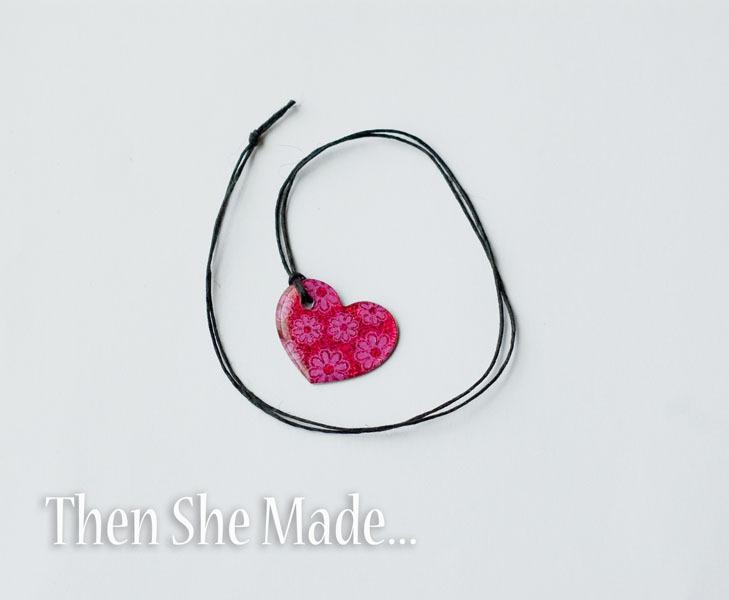 Then she made...: Heart necklace tutorial and giveaway news! I feel like I'm so behind on my Valentines day posts and Valentines day is just next week. So, before any more time passes, here's a quickie necklace idea for you. Plus, keep reading for more giveaway news. Step 2: Pick two stickers that are the same size. I used two identical stickers but you could use different designs, they just have to be the same size. Take your stickers and carefully stick them back-to-back. Press them together firmly. Tip: Go slow and make sure you line them up really well, otherwise it won't look as good. Step 3: Take your hole punch and carefully punch a hole through both stickers. Just be warned a normal hole punch might not go through both stickers, if you have a cropadile, I strongly suggest using it. Step 4: Next, attach your heart to your string. You have have two options here. See below. Option 1: As shown above, just cut your string and thread it through the heart. Then, tie a knot on the end and wear it as is. Make sure your string is long to both go through the heart and fit over your head. 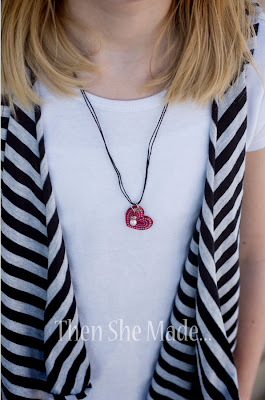 This one works great for kids to make because there are no jewelry findings to work with. They can make a bunch of them pretty quickly. Option 2: This option makes it a little more fancy. 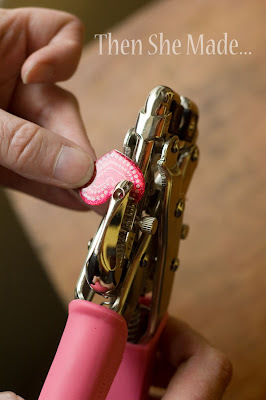 After you poke the hole in the sticker, attach it to a jump ring. Then thread the jump ring onto your string. Add in some other fun things like a little beaded charm and then finish it off by using crimp beads on the ends of the string and add a clasp. This option isn't as simple to make but definitely looks more finished. Even an adult would wear this one. Easy right? Yup. 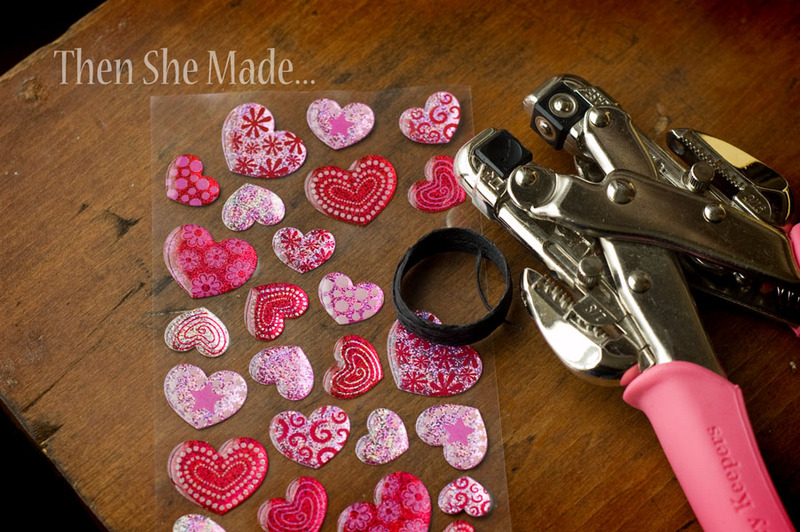 And, if you want, you could attach a cute little valentine note and say something like: "Valentine, you've got my heart on a string!" Awww! Also, just an update on the current contest. 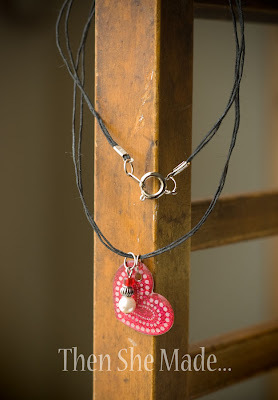 Don't forget to leave me a comment on this post: A New Friend and a Giveaway. 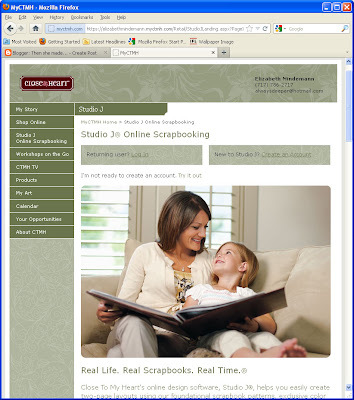 The contest will close on Sunday so if you want a chance to win a digital scrapbooking kit that includes 5 two-page layouts from CTMH's Studio J go enter now. It's a pretty awesome give a way. A $55 value. I wish I could enter as I'd love to win. Plus, it looks super easy to use! If you want more info about what Studio J is you can find out by going to Elizabeth Mindemann's Close To My Heart page. 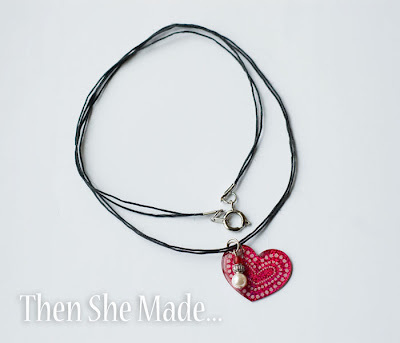 You can also stop by her blog, ejoym.blogspot.com or her facebook page at https://www.facebook.com/brokentreasure?ref=ts. Be sure to tell her you are stopping by via Then She Made. 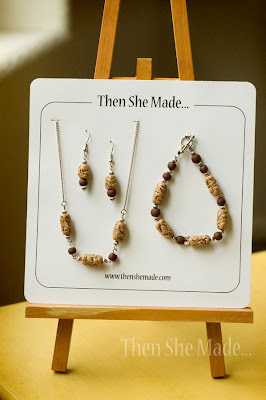 I love ALL the jewelry on this post. Really cute. 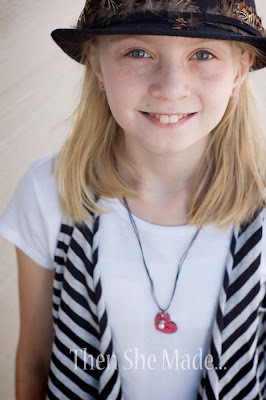 Amy - I love the necklaces! You have such a talent!! Your jewelry is simply beautiful! 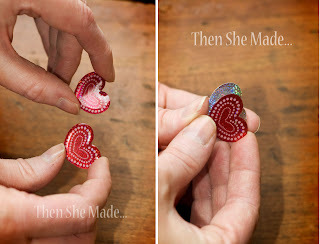 Such a simple but sweet idea! Thanks for the inspiration!